We can’t believe it’s here… the past year of dreaming, scheming and hard work has finally come to an end! We are so proud to announce the launch of our first patterns with the W.O.W. Spring 2014 Collection. We will definitely be clinking our wine glasses in celebration tonight! As we said in our first post, our idea is to release entire collections of patterns at one time. Sometimes our collections will be truly cohesive (such as the vintage collection we’re cooking up for the Fall! ), and sometimes they will just be a collection of fantastic bags that we love. Such is the case for the Spring 2014 Collection – an assortment of great, classic bags that anyone could use. 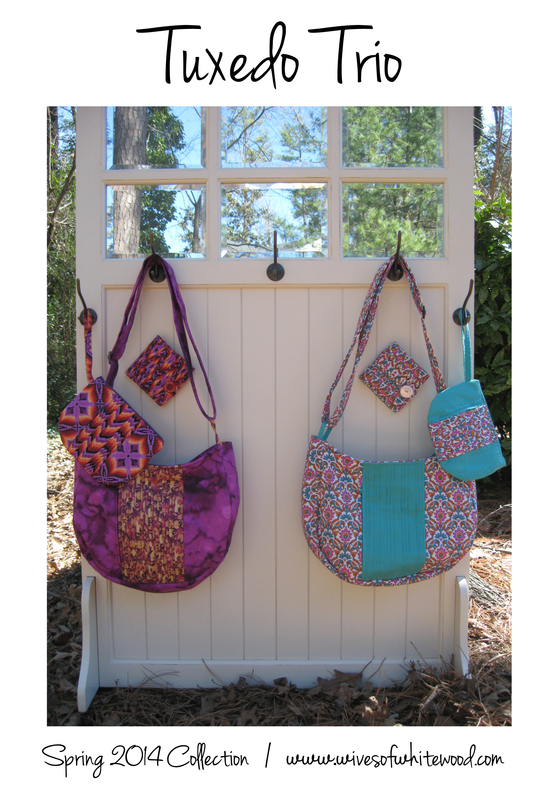 The following four patterns make six amazing bags, and we hope you will want to make them for yourself! This was the very first bag we designed, so it has a special place in our hearts. We wanted to design a bag with so many customizable details that you could sew it over and over with completely different effects, and we think we achieved just that. The Whole Shebang is a large multipurpose totebag with fully customizable outer and inner pockets, top or side straps, optional zipper closure, side ties or snaps, optional piping, and keychain clip. The finished size is about 14” x 20” x 10”. 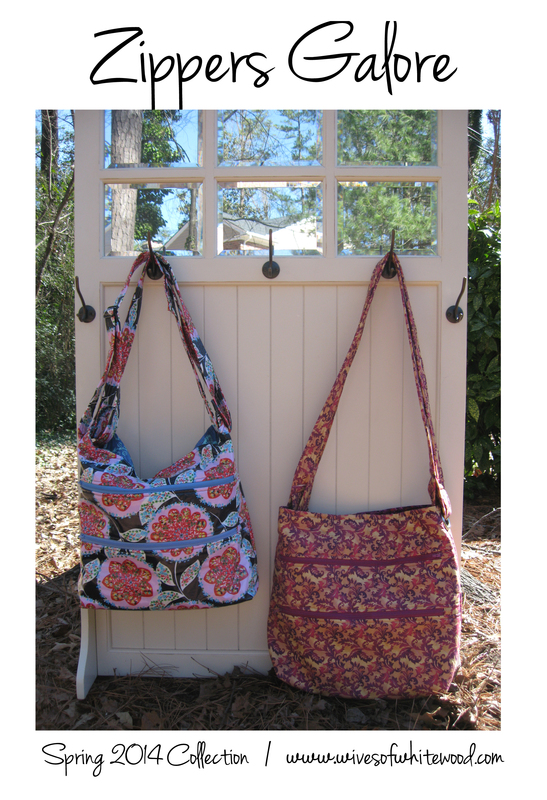 We have made Whole Shebangs that are serving as gym bags, diaper bags, beach bags, market bags, and light overnight bags. The possibilities are endless! We loved the idea of a bag that could go from day to night, from serious to silly. The Classic Convertible is a fun, convertible bag that can be worn as a shoulder bag or a large clutch. It features a folded top, removable strap, multiple inner and outer pockets, zipper closure, and optional card holder and keychain clip. The finished size is about 10” folded (15” unfolded) x 15 ½” x 3 ½”. We think this bag is especially cool in laminated cotton, which gives it that extra special touch when you’re out on the town. The Tuxedo Trio is a fun mini-collection of its own. It includes three coordinating items – a hobo, a wristlet and a wallet – all featuring a striking tuxedo pleat panel. 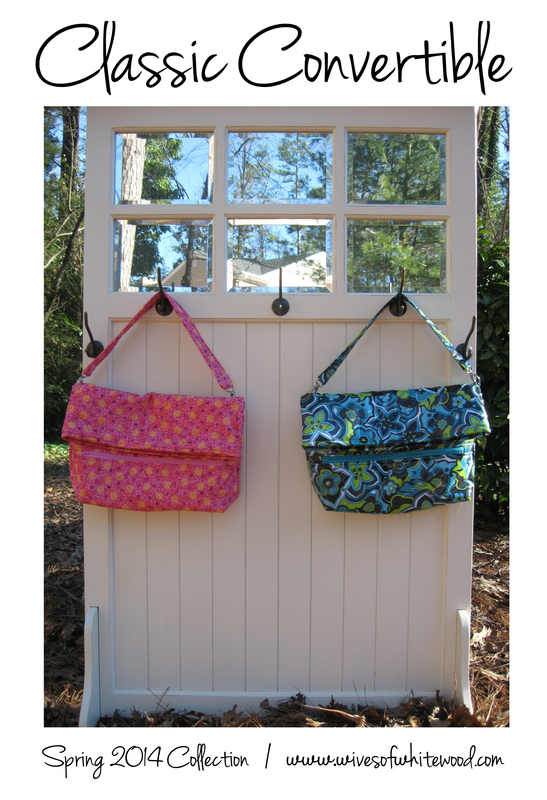 The hobo and wristlet have a hidden front zipper pocket and optional inner pockets. The wallet includes a card holder and large inner zipper pocket. 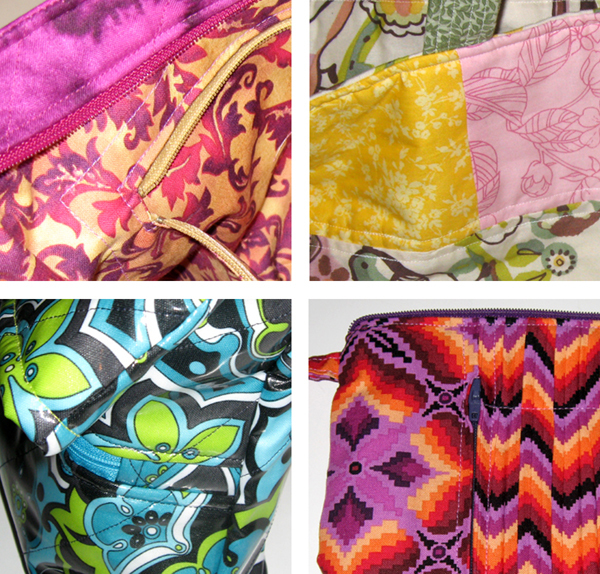 The finished sizes are as follows: Hobo – 10 ¼ ” x 13” x 4 ½”; Wristlet – 6 ½” x 8”; Wallet – 4 ½” x 4 ¼” folded (8 ½” unfolded). We absolutely loved mixing patterns and solids in different combinations with the Tuxedo Trio. And while the Hobo, Wristlet, and Wallet are all strong enough to stand on their own, you could also make an amazing three-piece ensemble. We know that we shouldn’t have favorites, but if we admit that we do, this bag would be it. Zippers Galore is a larger and different version of the Classic Convertible. Zippers Galore is an oversized messenger or shoulder bag that features a unique grommeted double-strap, multiple inner and outer pockets, and optional snap closure, card holder, and keychain clip. The optional center padded divider panel offers great protection for a tablet or laptop. The finished size is about 15” x 18” x 5”. As a workhorse messenger bag, it’s perfectly suited for heavy-duty daily use, like a laptop/work bag or a diaper bag. When we wear this bag around town, we always get compliments on its super unique style and awesome functionality. All of these patterns are available for sale in our Etsy shop or in our Craftsy shop for $9 each. We’re also offering a great combination discount – you can buy a bundle of all four patterns for $27 and get one pattern free! We will be posting in-depth posts on each pattern in the coming weeks with lots more pictures. We hope that you will enjoy making and using these bags as much as we have enjoyed designing them! Have you missed us? We have been working away since we last posted in October and we’re happy to report that we’re at the finishing touches stage now. We’ll be releasing our patterns here before February is over, so check back often. We can’t wait! Welcome to W.O.W. | Wives of Whitewood! We’re Ali and Courtney, next-door neighbors on Whitewood Road in Richmond, Virginia. We met six years ago and bonded over a love of sewing, wine, and reality TV. Earlier this year, we decided we would love to try and turn our sewing hobby into something more, and W.O.W. was born! Our idea is to present entire collections of sewing patterns at a time, hopefully 3-4 times per year. Since we love sewing bags for ourselves and for our loved ones, we thought a bag collection would be the perfect start. So in January/February of 2014, we will be releasing our Spring 2014 collection. 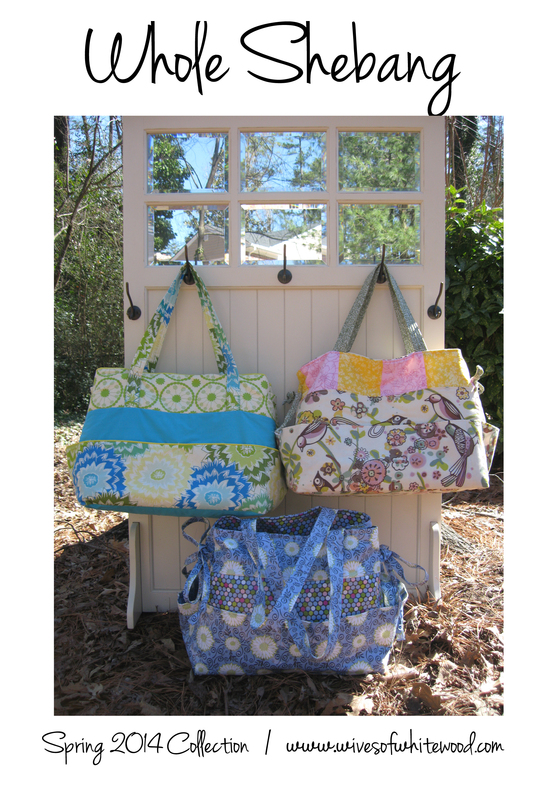 That collection will feature 4 patterns to make 6 different bags. We’ve designed a tote, a hobo, a wristlet, a wallet, a clutch, and a messenger bag that we can’t wait to share with you! We also love patterns that offer different ways to customize the final product, so we’ve included lots of options along the way. Here’s a sneak peek at what we’re working on for our first collection! We are so excited to see where this journey takes us, but more importantly, we want to offer fun and useful patterns for other sewers to enjoy. See you in a few short months!